Improve the efficiency and curb appeal of your home with Butler Kitchen Remodeling Services in St. Louis, MO. The seasoned kitchen remodeling contractors at Butler Home Improvement service clients in St. Louis, MO, and nearby locations. Butler is ready to aid you in deciding the optimal solution for enhancing your home or commercial establishment. Butler strives to both help and ensure that our clients understand the benefits, investments, and pros and cons of products and services before starting any kitchen remodeling project in St. Louis. Our home improvement consultants value our clients’ input about their style tastes. Butler then makes suggestions to match our specialties to make sure our clients are satisfied with our kitchen remodeling service. Being at the center of home or kitchen remodeling project is no small matter for some homeowners. That’s why Butler, Illinois and Missouri-based contracting pros in exterior and interior home improvement, utilizes our capabilities to implement personal design experience to customers. Butler is also known for our broad offerings including bathroom remodeling, window replacement, decks, and siding. Butler Home Improvement leads best-in-industry service standards. Our reputation is backed by the professional kitchen remodeling service we’ve done for our St. Louis clients. Click here to see our interior and exterior gallery to see our work. How much am I willing to spend? Redoing a kitchen, bathroom, or exterior home feature like a deck can be expensive. Fortunately, Butler provides worry-free quotes and contractors that will help you match your budget with your ideas. When it comes to kitchen remodeling in St. Louis and other exterior remodeling improvements, remember that every dollar you spend improves the value of your home. What’s my role in the project? Many homeowners want to be involved in color schemes, the design process, and even construction. Butler Home Improvement will work with you at every level while offering style tips to enhance the project. Who am I working with? At Butler, you’ll be working with expert interior kitchen remodelers. It’s crucial for customers to make sure any company they take on has a proven track record, associations and accolades, and a valuable team. What else can this company do for my home? There are plenty of contractors out there that highlight sunroom remodeling or window replacement. Butler covers several home improvement services in St. Louis, MO, and have a Handyman Service to take care of other jobs. What’s next? Once you’ve worked down a list of potential contractors, contact them or request a free kitchen remodeling quote. They’ll ask about what you have in mind, your budget, and other questions to get your next St. Louis kitchen remodeling project started. Ask questions like, How long will this project take? What if I change kitchen design ideas halfway through a project? Why hire Butler if I think I can do this on my own? What kind of return-on-investment am I looking at? Are quotes seasonal? The experts at Butler Home Improvement are more than willing to answer any and all of these questions in detail. Butler’s blog is another great resource for homeowners. For more than two decades, the Butler Home Improvement team has provided its clients with hassle-free interior and exterior contracting services in St. Louis and Illinois. We understand the strain and costs that goes along with any home improvement project, whether it’s installing an acrylic roofing system and patio cover or remodeling a bathroom. That’s why we focus on giving our clients with relatable advice and no-strings quotes to ensure your next kitchen remodel in St. Louis, MO, surpasses your expectations. Check out Butler’s dedicated White Glove Service and our commitment to excellence. In addition to St. Louis, Butler Home Improvement serves kitchen remodeling clients throughout Missouri and Illinois. We offer contracting for SunSpace amenities including screen rooms, solar shades, SlideClear Doors, and other exterior remodeling improvements. Contact Us today to get started! 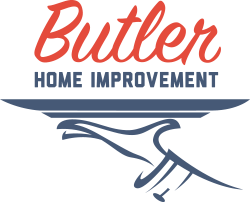 Since 1996, woman-owned and independently-operated Butler Home Improvement has served homeowners throughout the Greater St. Louis area with the highest standards of home improvement. Butler’s interior and exterior remodeling services are backed by the best products and services offered in the industry. Our team of high-skilled professionals are proud to deliver their best through The Butler Advantage and our White Glove Service. To learn more about Butler, or if you’d like to begin today on kitchen remodeling in St. Louis, MO. Contact us by calling (314) 329-5489 or check out these online reviews.